Economists Harold Cole and Lee Ohanian have a piece in the Wall Street Journal that deserves a prize for the devious use of statistics. They want to argue that fiscal stimulus is bad, and the New Deal only made the Depression worse. This is a familiar argument on the right—and I even heard it once from a Marxist economist—but it’s just not true. But boosting aggregate demand did not end the Great Depression. After the initial stock market crash of 1929 and subsequent economic plunge, a recovery began in the summer of 1932, well before the New Deal. 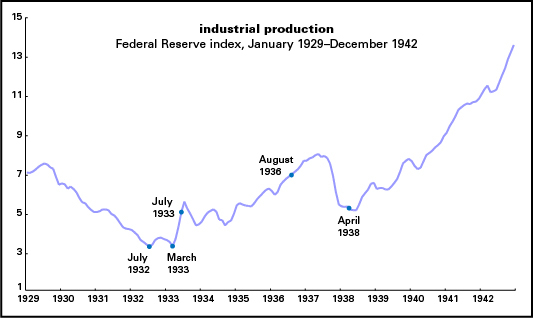 The Federal Reserve Board’s Index of Industrial production rose nearly 50% between the Depression’s trough of July 1932 and June 1933. This was a period of significant deflation. Inflation began after June 1933, following the demise of the gold standard. Despite higher aggregate demand, industrial production was roughly flat over the following year. Crucial months are marked. July 1932 is the phantasmic trough of the recession named by Cole and Ohanian. Note that there was little recovery at all in industrial production between July and March 1933—the official Depression trough, so designated by the arbiter of these things, the National Bureau of Economic Research. March 1933 also the month that Roosevelt took office and declared a bank holiday, ending a four-year run on the banks. A month later, he severed the dollar’s link to gold and made it clear that the U.S. government was determined to put an end to deflation. Though the alphabet soup of New Deal programs was yet to come, the break with previous orthodox economic policy was clear. And industrial production began a sharp recovery. August 1936 [note: I’d originally, and wrongly, said April 1936] is marked because that’s when the Fed began to double reserve requirements for banks, a policy move that Milton Friedman indicted for causing the relapse of Depression in 1937. (Though widely accepted, that argument has been disputed in a paper by Charles Calomiris et al, but that’s not relevant to the politics of this, given Friedman’s right-wing credentials.) Keynesians have also pointed to a marked tightening of fiscal policy, announced in 1936, for the return to slump. In other words, stimulus worked as advertised, and so did austerity. The unemployment rate fell by more than half between the May 1933 peak (two months after FDR took office) and the July 1937 low. They want to minimize this, but a decline of that magnitude is remarkable. They also want to minimize the broad economic recovery that occurred in the mid-1930s. But real GDP rose 30% between 1933 and 1937, an average of almost 7% a year. Again, nothing to sneeze at. Those who imagine that Roosevelt’s avowed reflation is not the cause of our recovery but that we had “reached the bottom anyway” are very much mistaken…. According to all the evidence, debt and deflation, which had wrought havoc up to March 4, 1933, were then stronger than ever, and let alone would have wreaked greater wreckage than ever, after March 4. Had no “artificial respiration” been applied, we would soon have seen general bankruptcies of the mortgage guarantee companies, savings banks, life insurance companies, railways, municipalities, and states. By that time the Federal Government would probably have become unable to pay its bills without resort to the printing press, which would itself have been a very belated and unfortunate case of artificial respiration. If even then our rulers should still have insisted on “leaving recovery to nature” and should still have refused to inflate in any way, should vainly have tried to balance the budget and discharge more government employees, to raise taxes, to float, or try to float, more loans, they would soon have ceased to be our rulers. For we would have insolvency of our national government itself, and probably some form of political revolution without waiting for the next legal election. If you think stimulus is a bad idea, make that argument. But don’t make up stuff about the past. The common interpretation is that we needed WWII rearmamant to pull us out of the Great Depression, that FDR’s programs weren’t enough. “April 1936 is marked because that’s when the Fed…” April 1936 is not marked, I am afraid. Sorry, Erik, that should have been August 1936. Thanks, Doug. That is what I thought but because April 1938 was marked I was a little confused. Thought of course August 1936 made sense in context. 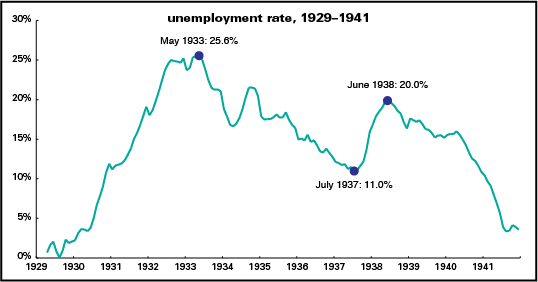 Do you have any information on the June 1938 spike in unemployment? Just want some help for my pedantic self. It followed the fiscal and monetary tightening of 1936-7. In 1936, the Supreme Court struck down eight of FDR’s New Deal programs, including the National Recovery Act (NRA) and the Agricultural Adjustment Act (AAA). Within a year, the recovery stalled and unemployment started going back up.